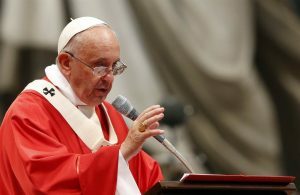 The document, dated December 8, draws extensively from a 2005 text issued by the Vatican’s Congregation for the Doctrine of the Faith, stating that men “who practice homosexuality, present deep-seated homosexual tendencies or support the so-called ‘gay culture’” are ineligible for the Catholic priesthood. For the whole report click here. Thank you. God bless you always. Amen! Great orthodox statement from someone we worry about occasionally! Next post: What Council of Church “leaders” Collected the NT Books?